Craig Ogden, surely now a household name within the classical music world. His work with Classic FM in particular is bringing the classical guitar’s sound to the general public on a daily basis whereas perhaps 20 years ago, it would have been a treat to hear such performances on Radio 3. 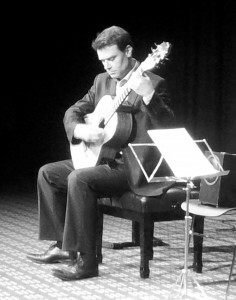 Craig is a relentless performer, who seems to be on a perpetual UK tour [http://www.craigogden.com/concerts/], yet somehow finds time to lecture at the Royal Northern College of Music. It might not be too far off the mark to suggest that Craig is the heir apparent to his compatriot John Williams in terms of popularising the instrument in the UK (and the world). At this small venue in Birkenhead we were treated to two sets from Craig, plus a solo set from his friend Tom Doughty and a few duets from the pair. Tom [http://www.tomdoughty.com/biography/] is a lap slide guitarist, composer, teacher, singer songwriter. Following a road traffic accident in 1974, Tom was left wheelchair-bound and lost partial use of his hands and fingers, which prevented him from playing guitar in the usual manner. However, through his tenacity and creativity, he has overcome his limitations and found a new method of playing the instrument that allows him to express his music. 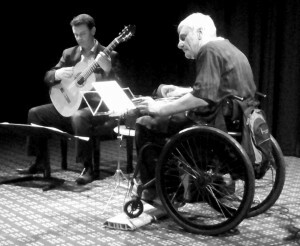 Tom’s set was improvised in terms of the list of pieces made up from standard blues interpretations, his own compositions and a unique and mesmerising version of Eleanor Rigby [http://www.youtube.com/watch?v=O_ftOQc9D14&feature=relmfu] which he cheekily introduced as a George Martin piece 🙂 Playing on lap guitars and a steel guitar with slide and finger picking techniques accompanying his own gravely bluesey singing, Tom’s performance was inspirational. Craig Ogden’s first sets featured a tremendously fast and accurate rendition of Bach’s Lute Suite no. 4 Prelude; the ubiquitous, yet beautiful Recuerdos de Alhambra by Tarrega and a powerful playing of Vals no. 4 by Barrios. However, the second set, opening with the luscious tones of Sevilla by Albeniz was certainly proof that, despite the small and remote surroundings of the venue, we were surely witnessing one of the finest performers on the circuit. Craig has a relaxed and laid back style in introducing each piece, yet these were very informative in explaining the intricacies of the instrument without being too technical. His version of Dyen’s Nuages [http://www.youtube.com/watch?v=xKtD_Z0XYwg&feature=plcp] was superb. Little wonder so many of his students from the Royal Northern College add this to their sets, no doubt inspired by Craig’s renditions. He ended his solo set with the amazing Rondo Rodeo by Gary Ryan [http://www.youtube.com/watch?v=DlN3tX28hsM&feature=plcp] – surely one of the most underrated contemporary composers for the instrument. Unashamedly populist in style and inspired by the Wild West, this is a real feel-good piece with some surprising techniques which Craig explained, such as making the guitar squeal like pig! Kewl you should come up with that. Execnlelt!